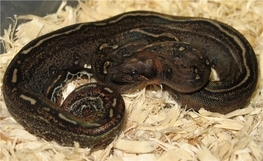 The first Leopard Boas popped up in a litter of what was thought to be normal appearing Sonora Desert Boas. 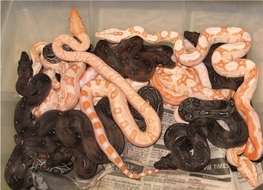 These boas were in the collection of Hans Winner of Germany. 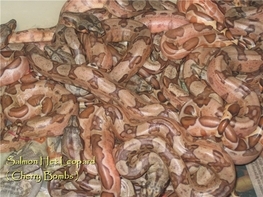 Hans proved that this Pattern anomaly Boa was an inheritable recessive trait by line breeding the leopard Boas back to siblings and parents. 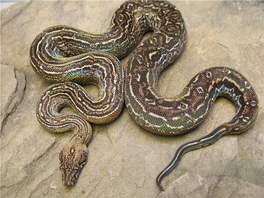 The leopard pattern is similar to that of a labyrinth Burmese python in that is has some stripes and dashes along its dorsal area. They have a unique feature in that some possess a gold head and some have a red chin & Red bellies. They also have beautifully marked faces that resemble the whiskers of a leopard & some Leopards are completely striped while others are Spotted. 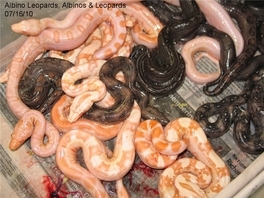 Even the normal gene carriers or Het for Leopard boa have a unique appearence ( see pics below ). 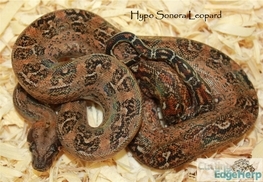 The Leopard Boa is also a very small boa and Hans reports mature breeding females to be just around 5 feet in length. 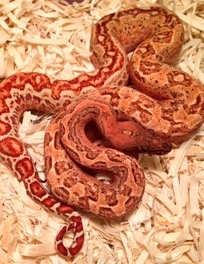 A very Unique & variable morph. 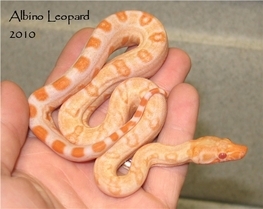 In 2005 my good friend Tom Burke bred a beautiful Coral Red Albino Boa to a Leopard Boa female & produced the first ever double hets for Albino & Leopard. I was fortunate enough to purchase a pair from Tom & Mine ( and his ) bred in 2008. 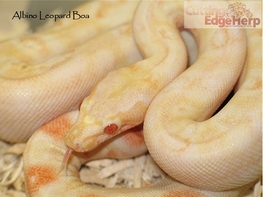 Both Tom & I were again fortunate enough to produce the first ever " Albino Leopard Boas ". I think the pictures speak for themselves.